Jessixa Bagley burst onto the children’s literature stage last year with the debut of her beautiful picture book “Boats For Papa,” a gentle story of loss, healing, and ultimately persevering. Bagley is both author and illustrator. The book has received numerous starred reviews, and it has been widely praised by children, the children’s literature community, and beyond. Her gentle watercolors are richly detailed, and her characters–a loving family of anthropomorphic beavers–will delight young readers. Jessixa: It’s been a long road for me to get where I am today, but every step has held a lot of value. I pretty much always wanted to make picture books. Ever since I was a small child, I was writing and drawing my own stories, books, and comics, creating characters and their worlds. Right after graduating college in 2004, I started writing picture books and submitting them to publishers left and right. I had been published for comics already at that point, so I figured I could finally get my real dream going and jump into children’s publishing. I think I made every wrong mistake possible with submitting my work for about 6-7 years. I just really didn’t know what I was doing and I thought I could go it on my own and I had a nice big stack of rejection letters to prove it. I was at a loss for what to do. Then I joined the Society of Children’s Book Writers and Illustrators in 2010. I was an inactive member still for a while- thinking arrogantly that I didn’t need to be part of a club to get published (and just not knowing what SCBWI had to offer). And, shocker, I still wasn’t getting published and didn’t understand why. Then one year I made the leap and decided to go to their annual summer conference in Los Angeles having never attended any previous SCBWI events at all. And that’s when things started to make more sense. I got to see first hand what my portfolio needed to look like and I got to hear about how the business of books worked-the real ins and outs of submitting work and what editors and art directors really cared about. After some tears, I went home and started over. It still took me some time, and lots more tears, but I finally started to find my voice as an illustrator and then as a writer. That’s when things began to click inside of me and that’s when things started to change. Once I found this “voice” inside of me that people would always talk about, the awards and opportunities started to show up. Then I did another Hail Mary in 2013 and went to the SCBWI NY Winter Conference and I was runner up for the portfolio showcase and that is where I attended a workshop by Alexandra Penfold (my soon to be future agent). Alex believed in my work, offered me representation shortly thereafter and then went to work submitting my book dummy for Boats for Papa (then called Drift). She put the book in front of Neal Porter- one of the most loveable men on Earth- and then rest is history. Jessixa: I use very fine waterproof black pens and watercolor for my illustrations. I use pretty inexpensive watercolor paper to help create my pooling affect in my paintings (pooling is what I call when the watercolor builds up in areas to create unique textures). I also use an eyedropper to help me spread my paint- a technique I created for myself so I can paint large areas fairly evenly with small brushes to retain the right look I want for my pooling. I like to do everything by hand and prefer not to work digitally, except for small touch-ups. Jessixa: My most recent book, “Before I Leave,” is about a little hedgehog named Zelda that finds out that she has to move away from her best friend (Aaron the anteater) and instead of being sad about leaving, they decided to cherish those last moments they have together. It’s a story pulled from my own experiences having to move when I was young and how hard it is to leave your friends. I wanted to use a style of writing that was very different than Boats for Papa so I wrote it in more of a letter format, like one friend writing a letter to the other. I was trying to approach it with a more open and poetic quality. Jessixa: This was so much different than my research for “Boats for Papa”-which was much more technical because of the boats and the nautical elements. For “Before I Leave” I looked at tons and tons of photos of hedgehogs and anteaters to familiarize myself with them for the book. (By the way, researching pictures of hedgehogs is probably the CUTEST research anyone could ever have to do.) I read a lot of facts about both animals, where they live, their everyday habits. They are both very fascinating animals. Fun fact: Both hedgehogs and anteaters have very poor eyesight. I thought that was a weird coincidence that I learned after I picked the animals. It seems like a good basis of a friendship, being able to relate to one another! Don: Any important things you learned about the subject while researching the book? Jessixa: I got very interested in the idea of having a hedgehog for a pet when working on my book! Once again, they are the cutest animals and you sort of can’t help falling in love with them when you are staring at photographs of them all day. But I found out that like reptiles they have salmonella on their bodies, which because I was about to have a baby, didn’t seem like a good idea. That and they are nocturnal and poop when they run. I figured we should only have one animal in the house that is awake all night and poops while it’s running. Pieter Bruegel the Elder– He was a master painter and the intricacies of his work are amazing. I’d love to see his traditional painting process. Heck, I’d take the Younger Bruegel too! Beatrix Potter– She is magic and I think she would be a kindred spirit. I’d love to see how she worked in nature and how her environment shaped her relationship with her characters. Richard Scarry– He would be SO fun to see work. I imagine he talks to his characters when he draws (like I do). I’d love to hear the backstories he created for his characters and why he thinks pigs would be such terrible drivers. Mary Blair– She was an amazing painter and I’d love to see her design approach and how that graphic eye influenced her art decisions. Frances Glessner Lee– She was an aristocrat in the 1940’s who made all of those dioramas of crime scenes that police used for forensic training. I love miniatures and it would be incredible to see how she worked (And just a little creepy). 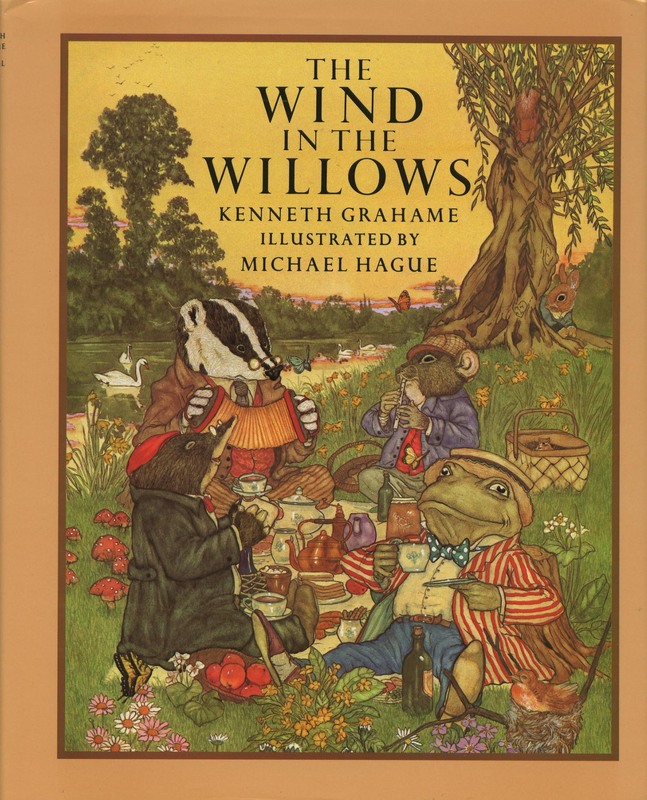 Jessixa: I’d love the chance to get to illustrate “The Wind in the Willows.” Those characters speak to my soul as an artist and feel like a part of me lives in that world that Kenneth Grahame wrote. I don’t know how I could do it justice, but I’d love to try! One of my favorite authors right now is Matt de la Peña. I thought the writing in Last Stop on Market Street was simply exquisite. I was really moved by the poetic quality to his work. It did more than just tell a story, it really made you feel. I’d love to see what stories he could create for my little woodland animal world! Jessixa: Because I am a VERY unorganized person, I try to set myself up for success with my books by being very organized in my process. I start off by making a list of how many and what kind of illustrations I have to do and how long I have to do them all. Also because I have a full time job and am a mother to a burgeoning toddler, my time is very limited so knowing how long a painting will take me and knowing how much time I have to paint it is a huge help for time management. I pretty much have a standard process for my illustrations: thumbnails, dummy, final sketches, transfer sketches to watercolor paper, pen over the pencil art, then watercolor. I also end up doing a lot of paint tests and color tests before I start working on the final art so I know I have my palette right where I want it. I work at actual size of the final book so I know exactly how fine the details will end up being (and also because I have a hard time using math to figure out percentages for scaling up and down). I usually work on one piece at a time but if I have several pieces that have similar backgrounds- like they are in the same room or it’s the same day- I’ll mix up a huge batch of the watercolor wash and paint the larger areas (like the sky) at the same time to maintain consistency. I also have a really great rhythm with my AMAZING book designer Jennifer Browne and my editor Neal Porter, so once I have a little chunk of final work to show, I scan it and email it into them so we can all make sure everything is looking good. It’s so great that they are willing to work this way because it saves me from illustrating an entire book, then having to turn around and make a ton of changes in the end. Altering as I go is much more efficient and less stressful for me- plus I get to talk to them more frequently which I love because they are just the best people! Jessixa: I am lucky that I feel like I have too many cheerleaders to count within my friends and family! My husband though is my biggest fan and supporter and he’s really helped me keep up the will power to keep going when things were (and are) really challenging. And my amazing picture book friends are just the best. My community of my crit groups, writer friends, and SCBWI partners in crime has really given me so much love and encouragement that I can’t imagine this journey being possible without them. I’ve made incredible friends by getting involved in the community of the picture book world. You think you can do this alone, but I’ve found that making books is an extremely collaborative process and the more people you have to support you, the better- and the work is better for it as well. Don: What’s on the horizon, what can your fans expect to see from you? Jessixa: I’ve got two great projects on the horizon! Next winter (2017) my third picture book, Laundry Day comes out and it’s such a fun and silly book and I’m really looking forward to its release! It’s about two twin badger brothers named Tic and Tac who are bored one late summer day and they decide to help their mother with the laundry and of course some wackiness ensues-as of course it always does with laundry. It’s very different in tone than my first two books which I hope readers will enjoy. And my next project-which is very dear to my heart-is a picture book collaboration with my husband, Aaron Bagley. We’ve always collaborated on art and this will be our first picture book together. We both wrote the story and are both painting the illustrations. The book is called Vincent Comes Home and is about a cat that lives on a cargo ship. It’s a very sweet story and that much sweeter to get to work on it with my best friend! It comes out winter 2018. It’s hard to imagine such a productive person as disorganized, but this gives hope for the rest of us! Can’t wait to see more from this writer and illustrator!